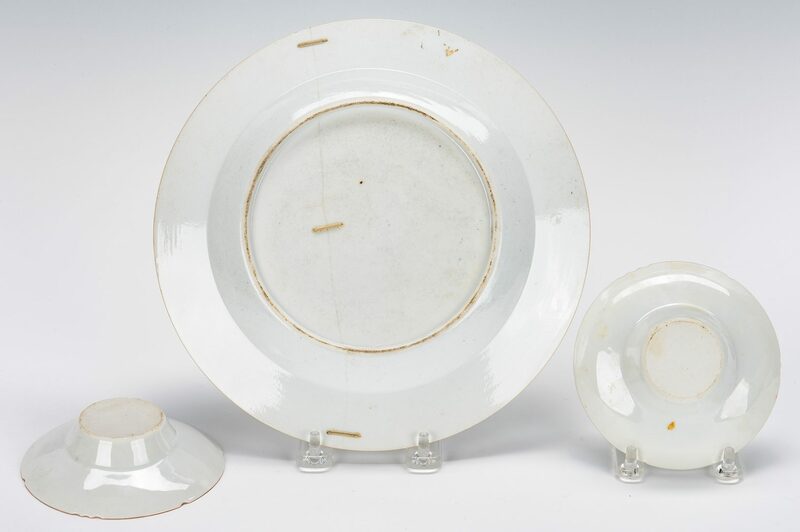 Group of porcelain tableware, most Chinese Export, 12 items total. 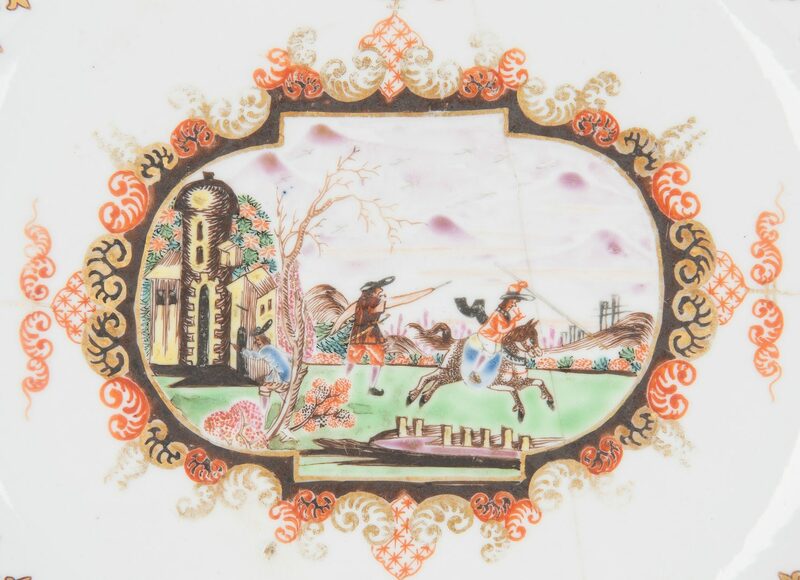 1st item: Dinner plate having center cartouche with battle scene with Moorish building in background, double gilt arabesque borders, 9 inch dia., old staple repairs to split near center, early 20th century. 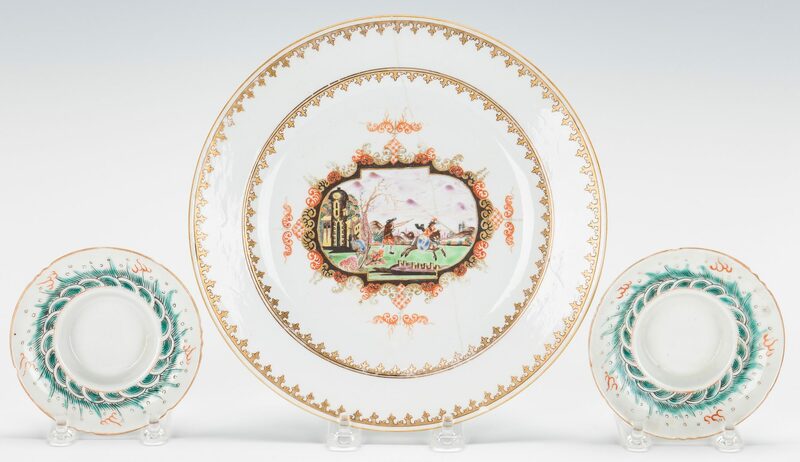 2nd-3rd items: Pair of Famille Verte saucer dishes with green waves and flaming pearls decoration and scalloped edges, 1 1/8" H x 3 1/4" dia. Early 20th century. 4th and 5th items: Two (2) Chinese Export serving bowls with cobalt and rust floral spray and cartouche decoration, larger one with Charlottesville, VA retailer label on base and both with additional label on base, 3 1/4" x 8 3/8" dia. and 2 7/8" x 7 3/8" dia. Early 19th century. 6th & 7th items: Pair of Chinese Export low bowls with rust pomegranate decoration, chop marks to base, 2 1/2" H x 6 1/4" dia. Early/mid 20th century. 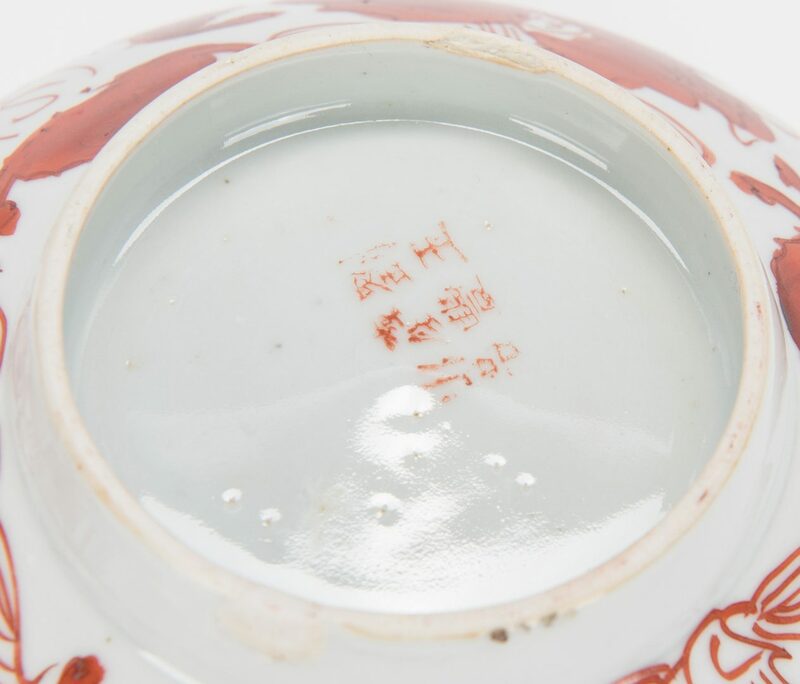 8th item: Chinese Export small serving bowl, white ground with pair pink flowers and green and blue border decoration. 3" H x 6 3/8" D. Early 20th century. 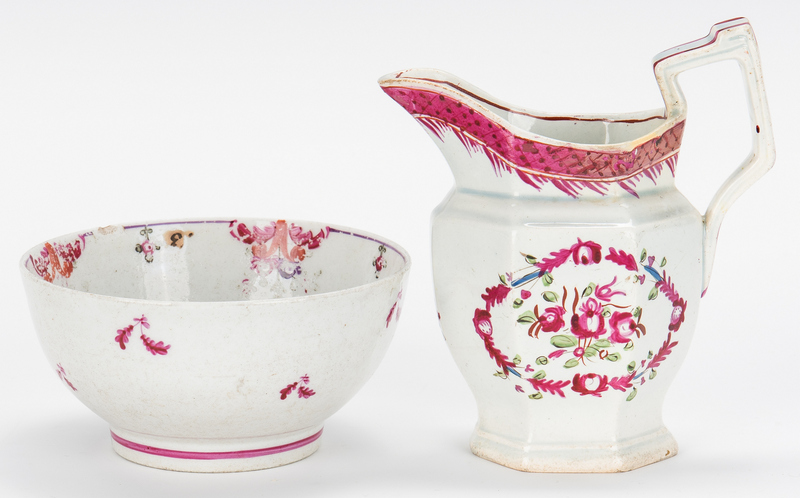 9th-11th items: Three (3) Chinese Export bowls, one plain and two with floral spray decoration. 1 1/4" H to 5 3/8" dia. All late 19th/early 20th century. 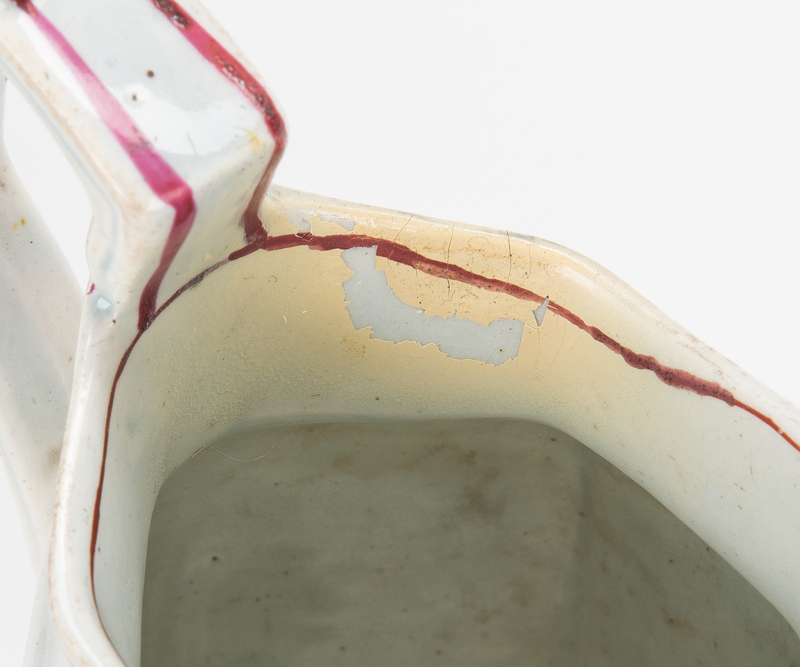 12th item: Small pitcher with blue/white glaze and pink floral decoration, 5 1/8" H. Repaired at handle rim and on base. Possibly English, late 19th century. CONDITION: Plate with old staple repairs and small chip on rim. 4th-5th items with hairline cracks along sides and on base of larger bowl. Few scattered small rim chips on some bowls and some wear to decoration. See description for additional comments.